How to Hold a Chicken without it scratching you. Have a look at our amazing poultry carrying boxes - as seen and used at the National Poultry Championships. If you show your birds these really are fantastic - can be stacked and wheeled along into the show hall. From £81 each including delivery & personalisation. Need a box to take your new hens home in? We also sell Cardboard Pet Carriers at £2.95 each. I was initially introduced to this feed when I visited one of my clients who had hatched some eggs from me. When I visited I could not believe the size of the chicks that were only 4 weeks old. They were already the size of my 6 week old chicks and I had to double check the dates for hatching as I just could not believe how advanced the birds were. This was enough for me to give the products a go, I started using the feed in July 2010 and I have not looked back since. I am convinced that this is one of the reasons why I have done so well showing and breeding my birds this year. They literally ooze with presence and health - this comes from within. I wanted to share a photo of the difference with one of our 'old' girls - she is still growing her new feathers but hopefully you can see the difference. Summer 2010 - Dry brittle Feathers - very few feathers around the face. This bird had been fed good quality feed and added oil to her diet to try and improve her plumage - no improvement after 12 months. Here is the same bird in Winter 2010. After being on Fancy Feed for 6 months. She is still growing her new feathers but you can see around her face how many more feathers she now has. Her feathers are far healthier / glossier and less brittle. Below is a list of products that I use and can recommend. 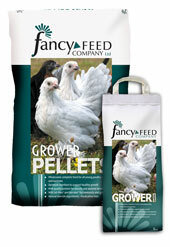 FANCY FEED - Great quality - realistic prices. As fed to our chicks. Uniquely formulated to provide a complete balanced diet for all types of poultry, chicks , ducklings and goslings. To be fed from hatching to 6 - 8 weeks of age. Specially formulated to provide a complete balanced diet for all types of poultry chicks ducklings and goslings. To be fed from 6 - 20 weeks of age. As fed to our non breeding birds. 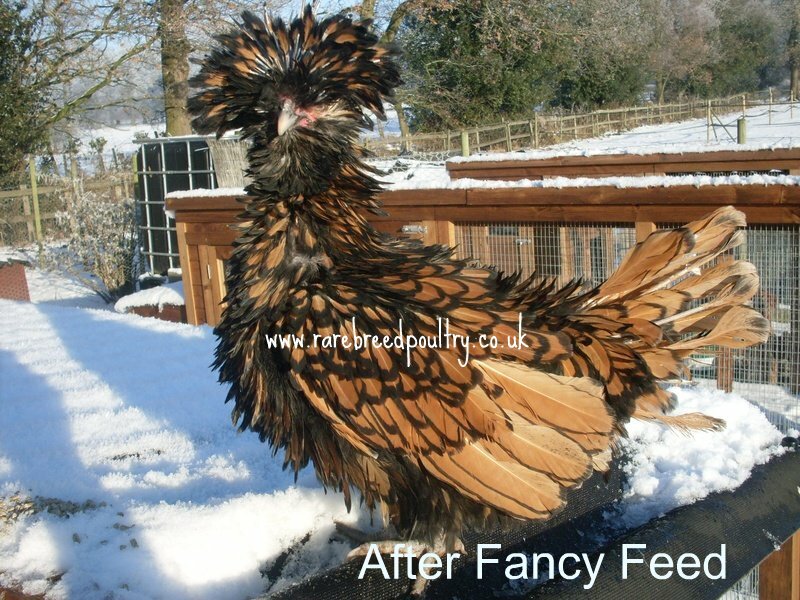 Ideal for free ranging and penned birds alike. Layers pellets are formulated to provide a complete balanced diet for all types of adult and laying poultry, ducks geese and bantams. Fed from 20 weeks of age. Mixed Corn is an appetising blend of English Wheat and cut maize. 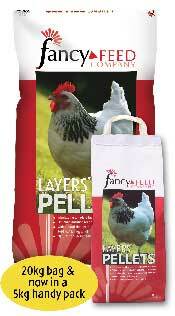 It can be fed to all types of poultry, waterfowl and bantams to complement a fully balanced diet of pellets or mash. For more details on all of these products please visit the manufacturers website. Feed Chick Crumb from hatching up to 6 - 8 weeks or Growers Pellets from 6-8 to 18 - 21 weeks. Full feeding instructions for these ages are on the back of the bag. 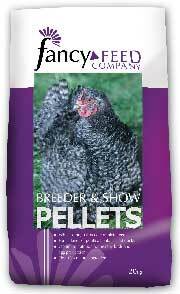 Fancy Feed Layers' and Breeder & Show Pellets can be fed from 18 weeks of age. To help ensure birds receive a balanced diet, pellets are best fed ad lib and not mixed with additional grain or mixed corn. As a guide, birds should consume a minimum of 100g per day (large birds) or 50g bantams. 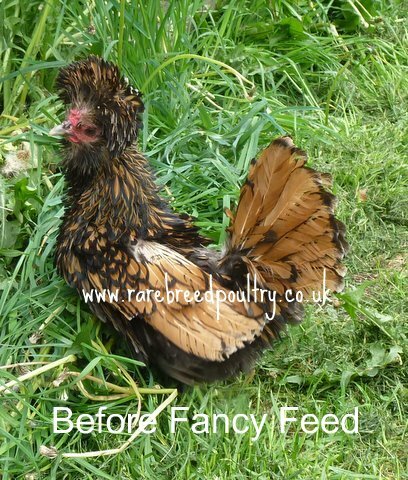 A treat of Fancy Feed Mixed Corn may be fed in the afternoon or evening after the main ration of pellets has been fed. This ensures that the birds do not fill themselves with corn in preference to the fully balanced food. 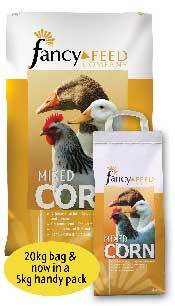 Feed Mixed Corn at a rate of no more than 28g per bird per day in addition to the recommended amount of a fully balanced diet, like Fancy Feed Layers' Pellets. Ensure clean fresh water is available at all times. Birds should have access to a source of insoluble grit at all times to aid digestion. "Greens" like carrot tops or cabbage leaves are great for penned birds to peck at if they cannot free range. "Greens" like carrot tops for penned birds to peck at if they cannot free range - please do not give large amounts of greens as they can cause upset stomachs.